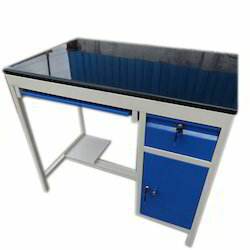 Counted as one of the prominent organizations, we are engaged in providing a wide range of superior quality SS Computer Working Table. Moreover, our clients can avail this table from us in different specifications at the most reasonable price. - Key board tray with smooth slider drawer in built system. - Handles, lock and magnets are use to be standard SS 304. - Nylon bullets lugs on legs. 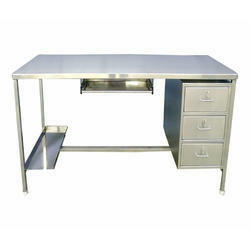 S.S. Office Computer Table is custom made & best suitable for working purpose. This are made to size & different drawer sizes are available. MOC = S.S. or M.S.